Man, I’m telling you, ever since cryptocurrencies have entered the mainstream market, trading robots are flooding the net. It’s like the early days of Binary Options all over again, except now they are repackaging old products under new names. Binary Super Bot is now Bitcoin Extreme Profit Bot and Multi-Millionaire-Binary is Magic-Crypto-Wealth. All the same, believe me. Every day I hear about a new one, better, faster and more profitable. Today it is CentoBot. Let’s dig in. Ok but let’s move on and find out more about CentoBot: this was actually a binary options robot when it was first launched but now they’ve put a new twist on it. Cryptocurrencies! Just like I was telling you in the beginning: same product, different marketing. Actually, they didn’t even change the name, just introduced new assets. They don’t have a sales pitch, no video with fancy cars or jets, no fake testimonials and not much info about the robot altogether so there’s not much to go on. 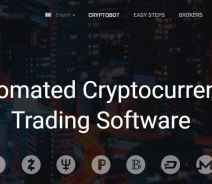 Of course, for the purpose of this review I created an account to try and use all the features of the software, so here’s what I can tell you about it: once I gave them my (obviously fake) details, I was redirected to the trading room which showed 10 robots, each using different strategies, indicators, and settings. Some of these robots are based on RSI, others on Moving Averages, ADX and so on, or at least that’s what they are saying. In fact, I have no idea how the signals are generated and no way of checking; I can only take their word for it. 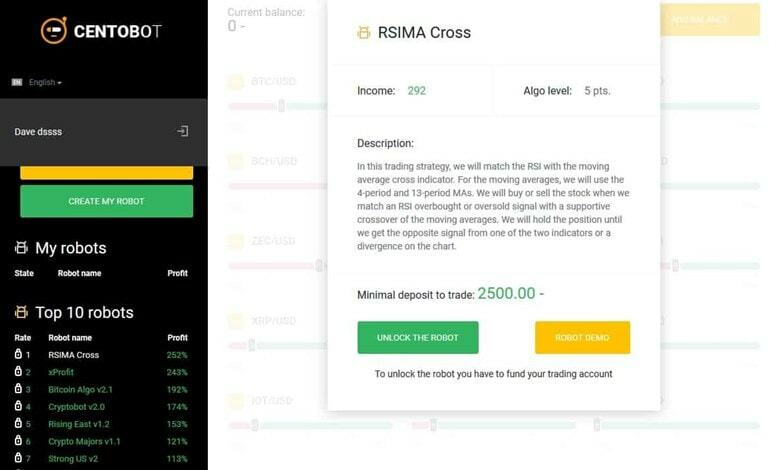 Once you launch your desired robot, the signals are automatically transferred into your BinaryCent account (this is the only broker available) but despite this, their Disclaimer reads “Information on CentoBot should not be seen as a recommendation to trade binary options […] Any trading decisions that you make are solely your responsibility.” I’d say that a software that trades automatically on my real-money account does more than just recommend. Once you push the “On” button, all trading decisions are taken by the robot. Depending on what algorithm/robot you want to use, you will have to deposit different amounts to unlock the respective robot. The lowest option is $250 and the highest I’ve seen is $2,500 for the RSIMA Cross robot. That’s huge, in my opinion, and you should think twice before depositing that amount of money with BinaryCent, a brokerage that is not regulated by one of the major financial watchdogs. A thing to note is that the minimum amounts change from day to day. I went to their website on two separate days while writing this review and on my second visit the RSIMA robot was 500 bucks only. However, a robot that was previously 500, suddenly changed to $2,500. Demo mode is available but as far as I can tell, this is just a simulation with a whopping length of 1 minute during which the selected robot opens a bunch of trades, winning them all (or the vast majority). The user cannot do much else than watch during this Demo and the result is the same each time: you will end up in profit. Profit of virtual money of course. 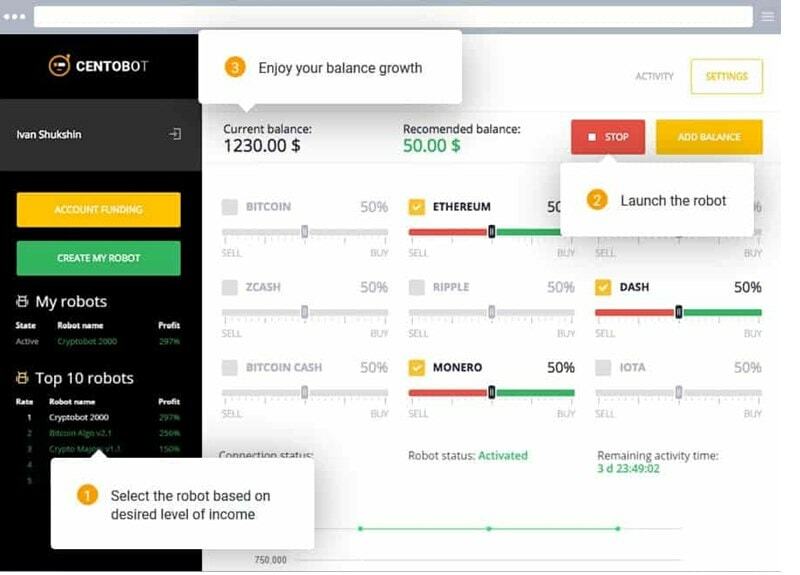 Each robot has an “Income” tab and an “Algo level”. For RSIMA Cross, those are 292 and 5, respectively. These numbers are a mystery! They don’t explain what any of it means; 292 bucks per day, month, year? 292 percent profit maybe? No idea. And the algo level number is just as mysterious. Wrapping Things Up: Should You Use CentoBot? I’ll be blunt here: this thing will most likely lose money. It’s not a straight up scam, but rather a means to make your deposit with BinaryCent. Call it a marketing tactic, call it whatever but don’t call it a money maker. 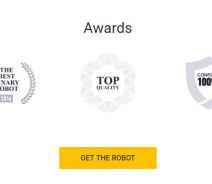 Their website has a single page, with some hype talk and awards from before CentoBot even existed. Important information is missing and overall this software is very similar to an old binary options bot, which makes me believe it’s just a repackaging of another unsuccessful product. 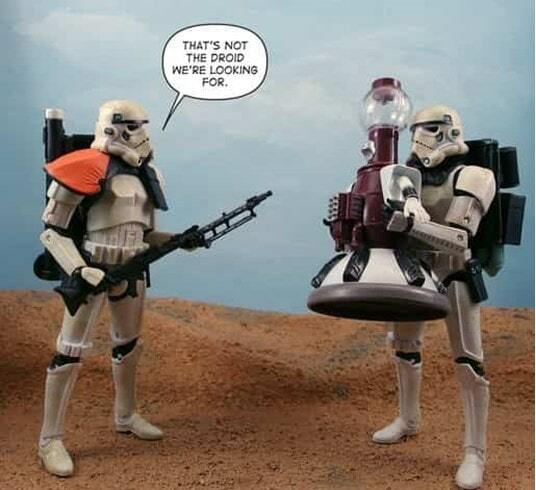 Either way, new or old, CentoBot is not the droid you are looking for.